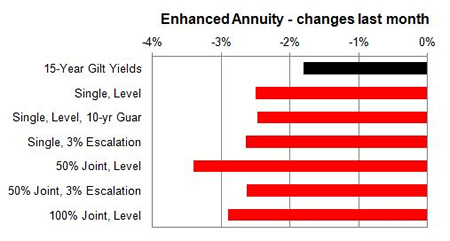 Enhanced annuity providers have decreased their rates further than expected in a volatile gilts market although people retiring with their pension fund invested have benefited from high equities. People retiring that remain invested before taking their benefits have seen their pension funds increase in vale as the FTSE-100 index reaches a new high of 7,037 during the month after starting the year at 6,566. This has countered the recent volatility in gilt yields and annuity rates which are near their all time lows. Standard providers were up slightly by an average of 0.03% and we would expect to see decrease of 1.83% in the short term and in the medium term of 3 months annuity rates will increase by 2.33%. 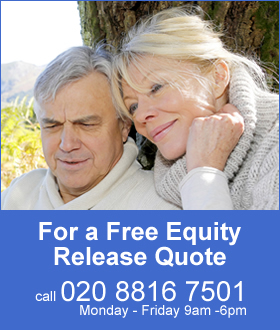 Smoker and enhanced annuity providers decrease their rates by 2.67% on average with an increase of 0.87% possible in the short term and in the medium term of 3 months we can expect an increase of 5.47%. Equity markets started at 6,947 and decreased by 92 points to end at 6,855. 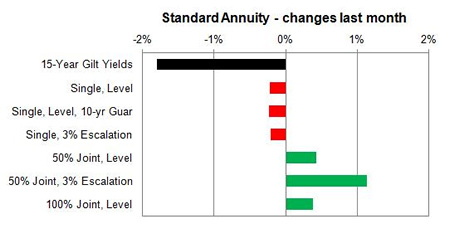 All annuity rates decreased with 11% rising, 26% remaining unchanged and 63% decreasing. Standard annuities were mixed this month with 50% joint life rates increasing by up to 2.1% for those aged 55 and other ages by about 1.0%. Single life rates decreased but by no more than 1.0%. For enhanced and smoker rates all decreased during the month with the highest fall of 5.8% for 50% joint life aged 55 and other high falls of 5.1% for single life including level and 3% escalating rates. The majority of all rates have reduced by between 1.5% to 4.0% and none have remained the same or increased.